The objective of this tutorial is to show you how to run Auto-fill scheduler. 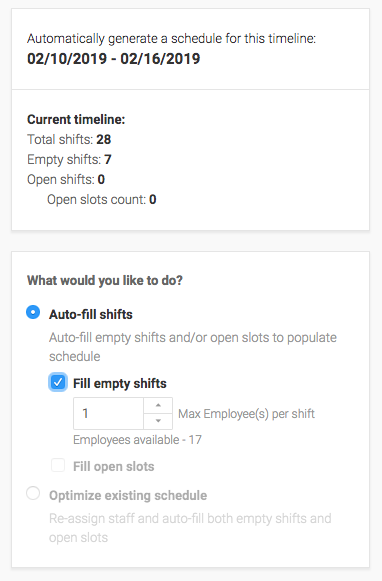 Auto-Fill Schedule will allow users to auto-fill empty shifts and open slots, and optimize the existing schedule. You must have a manager access privilege to run auto-fill schedule. You can run auto-fill schedule from the 'Schedule Overview' only. You can run auto-fill schedule on the future timeline only. You can run auto-fill schedule from the 'Position and Employee' views. You can run auto-fill schedule for a 'week, 2-week, and 4-week' timelines. You can apply 'Position and Location' filters. You need to create or copy shifts (empty or with open slots). Step 1: Click on the 'Auto-Fill Schedule' tab as shown in Image 1. 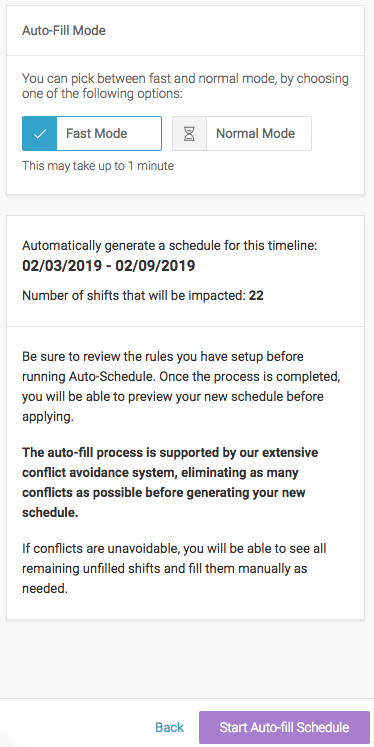 Step 2: Select the desired action under auto-fill shifts as shown in Image 2.
Review the selected timeline, it represents all shifts displayed on a schedule that will be used by our engine to calculate your schedule assignments. Counters will display the number of shifts in the selected timeline. Select the desired action: You can now choose to fill empty shifts or optimize your existing schedule. On ‘Auto-fill shifts’, you can select to fill empty shifts, fill only open slots, or both. When you select Auto-fill shifts you will be able to select the maximum number of employees that can be assigned on a single shift. The default value will be 1, while the max number will equal the number of employees in your current selection (filtered by position and location). ‘Optimize existing schedule’ will optimize the existing shift assignments, while also filling empty shifts and open slots. Optimizing an existing schedule is a more exhaustive process and will take longer to complete. Step 3: Enable/disable desired rules to adjust the results of auto-scheduling as shown in Image 3. You can select which rules should be included in your schedule calculation. When enabled, the selected rules will be viewed as hard constraints, avoiding the creation of new conflicts as a result of auto-schedule. Important: When disabled, rules will be ignored during schedule calculation. However, after the calculation is completed and saved, the conflict checker will display all the existing conflicts. Step 4: You will receive a recap of shifts that will be affected by the engine’s calculation. A calculation will be conducted in fast mode, by default. Click on the ‘Start Auto-Fill Schedule’ button to start the calculation as shown in Image 4. When you choose to run Auto-Fill Schedule in the Auto-Fill Shifts mode (both ‘Fill empty shifts’ and ‘Fill open slots’), just before running calculation, you will be able to select two different speed modes for the calculation. If you want to get good but fast results, select the Fast Mode and the calculation will be completed in less than a minute. On the other hand, if you need better results (e.g. fewer conflicts and empty shifts, etc.) and can spare several minutes, choose the Normal Mode. The Fast Mode is set as the default mode. Step 5: Preview your new schedule without reviewing shift details as shown in Image 5. Shifts altered by the auto-fill calculation will be marked with white stripes, while those unaffected will be displayed as usual. The number of empty shifts and number of conflicts will also be displayed. Step 6: Now, you will be able to either apply or discard the results of the generated schedule. Discarding the schedule will revert the schedule to its previous state, i.e. before the calculation. If you choose to apply the generated schedule, this will overwrite your existing schedule with the new schedule. Step 7: When you apply the auto-fill scheduling results, the schedule will be saved and potential conflicts will be displayed. Once the schedule is created, you need to publish it to make the employees aware of their shifts. The conflict checker will display all conflicts, including those that were disabled during auto-fill calculation. If you have any queries or wish to participate in the beta phase, please don't hesitate to reach us at marko.dakic@humanity.com. Happy Scheduling!